Butler with 20 fourth quarter points finished with 29, including 12 of 16 at the free throw line to bail the Bulls out of a stale bread and water sort of effort in which they trailed by 21 points early in the fourth quarter. So, yes, it wasn’t all that much to brag about as the Bulls brought back most of their starters to finish against Atlanta’s third line reserves. But Butler, who is shooting well in the preseason in showing resolve as a starting shooting guard and averaging 21 points the last four games, did make the big shot when called upon. “I’m just glad we won and that my teammates had the confidence in me to take that shot, and to have the ball in my hands late,” said Butler of the out of bounds play with 1.5 seconds left drawn for him with an inbounds pass from Kirk Hinrich. “I don’t think it is ever good to be down 21 points, but it shows our resilience and how we keep fighting and playing until the end of the game. I think we have a team full of options, a bunch of guys that do a lot of things well, and tonight they put the ball in my hands. The Bulls are as well, though it does make for an intriguing negotiation this month as Butler is eligible for a contract extension. If not agreed to by Oct. 31, he would become a restricted free agent next summer, which means the Bulls could match any offer. It’s reminiscent of the Taj Gibson negotiation a few years ago: Risk playing through the season without a big extension and maybe make more money as a free agent. Or agree to a deal and guarantee tens of millions of dollars now? It likely will come down to the last seconds as Gibson’s did. Meanwhile, Butler is making the most of the big minutes he is playing, a team high 29 per game in the preseason and team high 18-point average in the 3-2 preseason. It’s a big positive for the Bulls on a mostly negative evening. One of the major uncertainties with this Bulls team was whether Butler could develop as a legitimate shooting guard. And though he’s not a classic spot up shooter, he’s shot the ball better from the perimeter the last two preseason games. His game winning three was the first three he’s made this preseason after attempting just one three in the first four preseason games. He was one of four on threes Thursday. But Butler began to make midrange jumpers the last two games, and his real value is being able to defend the high level wing scorers, like LeBron James, which is a hole the Bulls have without Butler’s defense. It’s been a much more aggressive Butler offensively this preseason. The other positives in a mostly desultory Bulls effort for three quarters was Derrick Rose, who had 10 points in 20 minutes and was rested after that, and Joakim Noah with 13 rebounds and three blocks as Noah moved more boldly than he had previously in the preseason in this return from knee surgery. Noah, Pau Gasol and Butler came back midway through the fourth quarter with the Bulls trailing by a dozen and finished the game. Rose shot three of nine, just off on a few layups on drives and he did make a three. But of more significance was Rose’s run late in the first half with the Bulls trailing 38-22 with just over three minutes remaining. Rose had seven points to bring the Bulls within 10 at halftime and they might have been closer if Noah and Gasol hadn’t committed turnovers in the last 30 seconds. It was the sort of Rose run the team lacked the last two seasons; not necessarily to win the game at the end. But to stay close or make it a contest sometime during the game when no one could make a shot. That was the story of a brutal first half in which the Bulls were one of 10 on threes with nine turnovers and were outrebounded. 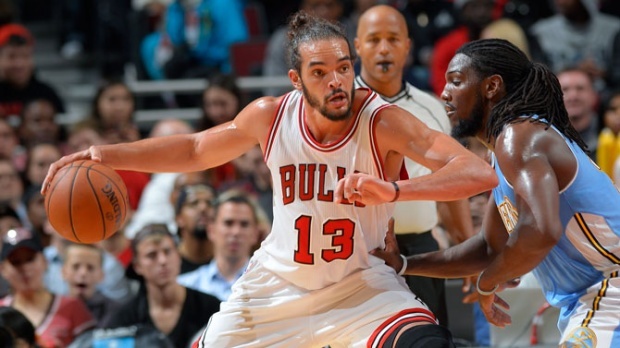 Though Rose was cautious in his post game comments, his play in that juncture was crucial. Though the Bulls had that big finish, it was mostly against players who’ll never finish games. And though there’s been much talk about all the additional offensive options the Bulls have—and they have added several—they’re still going to have to rely on Rose being the team’s leading scorer and key offensive option when in trouble. Rose showed he can make those plays, beating the Hawks defense regularly with quickness, though he wasn’t able to finish a few times. The same might not be said about the Bulls, who now have trailed by 21 points in their last two preseason games, both wins. The Bulls were without Mike Dunleavy again with a minor sore knee. Rookie Doug McDermott started and was defended at times by former Bull and fellow Creighton shooter Kyle Korver. Korver had nine points on three of six threes. McDermott had four points and missed his three threes, though he had nine rebounds. Mike Scott led Atlanta with 15 points. The Bulls starters played mostly even in the first quarter with the Bulls ahead 11-10 when Noah and Rose came out with just under five minutes remaining. But the Bulls reserves stumbled once again, which has been a pattern in the preseason, as the Bulls fell behind 20-15 after one quarter and were trailing 31-19 when Rose, Noah and Butler returned midway through the second quarter. Rose’s strong finish kept the Bulls within 10 at halftime. But that group couldn’t get much going after halftime as the Bulls offense the first three quarters other than Rose was too often deliberate with several times Rose being stuck with the ball with under five seconds on the shot clock and having to force up a shot. Thus far the offense has been stagnant with not enough push with the ball. It didn’t help the Bulls ability to run that they were outrebounded by the Hawks through three quarters. The Hawks led 66-47 through three as the Bulls had 17 turnovers and were one of 13 on threes with Rose having made the only one to start the game. Rose made another that was called off as he had stepped out of bounds, though his outside shot looked mostly good. The Bulls then opened the fourth quarter with a pair of threes from Nikola Mirotic and one from Tony Snell that suddenly made it a 14-point deficit with almost 10 minutes left and close enough for Thibodeau to have his starters get some game closing situations. Then Butler cashed in, fouled on a three-point shot with 14.1 seconds left and making all three. And then raising the ante and going for broke with his three after the Hawks had taken a lead with 1.5 seconds left.